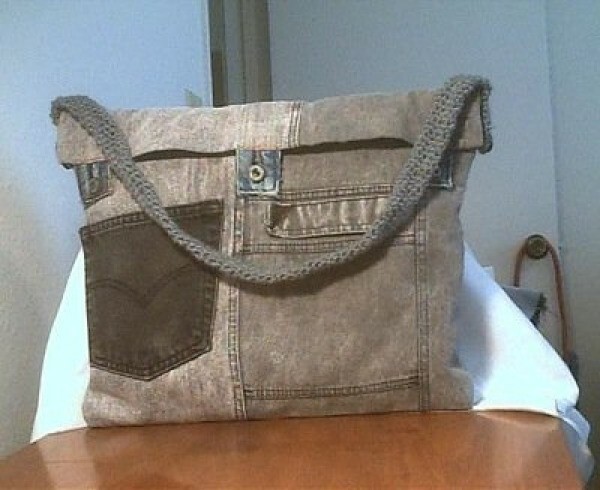 This lap top bag is constructed from several different pairs of jeans, lined with flannel and has a crocheted strap. These instructions are a guideline for this bag, but there isn't a wrong way to do this. Basically, as long as a lap top will fit into the bag, it's perfect. 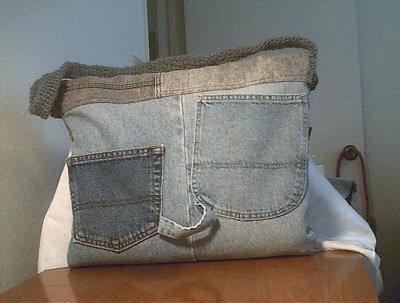 Cut off two legs from either the same pair or different jeans. Open legs by cutting the length of the inseam from bottom to top. From each leg, cut a section measuring approximately 17x12 inches. Sew pockets to each section. With right sides together, sew front to back on three sides. Cut lining fabric approximately 17 inches wide and 24 inches long. Fold length in half with right sides together and sew the two sides together. For both lining and bag, turn top edge 1/2 inch; to the inside and press. Turn bag to the right side, but leave lining with right sides together. Slip lining into the bag, match side seams and sew lining to bag at top edge. Cut a section of jeans approx. 12.5 inches wide and 5 to 6 inches in length. Finish edges by folding edges 1/2 inch to the inside and double stitch. Cut the buttonhole section from 3 waistbands approx 2.5 inches long and attach to flap at both ends and in the middle. Sew buttons to front of bag at those areas. With scrap yarn, single crochet approx 15 inches and 5 rows, then sew to sides of bag. Or use waistbands cut from two or three pairs of jeans to get appropriate length. Thanks, I've been looking for DIY on this. Can't wait til my son grows out of his jeans, lol. Didn't think I'd ever say that! This is very cool! Thanks for sharing! Brilliant! Thank you for sharing this awesome bag wiki.